This is one of those “Year In Review” articles. In this case it is a review of the most popular posts of the year on Crossings. Click on a blue link to view a post or page. 1. Newcomb’s Ranch Newcomb’s Ranch is a popular stopping point for motorcyclists on California Route 2, The Angeles Crest Highway. I’m never entirely sure why a post is popular, and that is the case with this one, though the place itself is popular with me, since I rode to Newcomb’s four times in 2012. 2. Digital Sensor Sizes This post was published on August 7, 2011, but still came in at 2nd place in popularity for 2012. It includes a visual representation of the relative sizes of the most common digital camera sensors. 3. 1948 Indian Chief Apparently I’m not the only one who drools over old Indians. A stock 46 Chief that was for sale in October 2012. 4. Using Patterson Developing Tanks The instructions that come with Patterson developing tanks are generally good, but I wanted to add a bit more information to them and point out some helpful information sources on the Web. 5. Moto Guzzi, Not Morgan From a distance, the Moto Guzzi trike in this post appeared to be a Morgan – until I walked close enough to identify the Moto Guzzi V-Twin engine that powered it. The popularity of this post was largely due to the members of a Finnish Moto Guzzi club. Thanks, guys. 6. Motorcycle Rides This is not a post. It is a category in the blog’s menu bar that includes several ride articles. I don’t keep the category as up-to-date as I should. Mouseover the category in the menu bar at the top of the page to see the various rides, then click on a ride in the drop-down menu. 7. A Gilroy Indian Chief A “display” chief, apparently cobbled together from available parts when the Gilroy factory was divesting itself of stock in 2003. 8. 1946 Indian Chief Are you starting to see a pattern here? 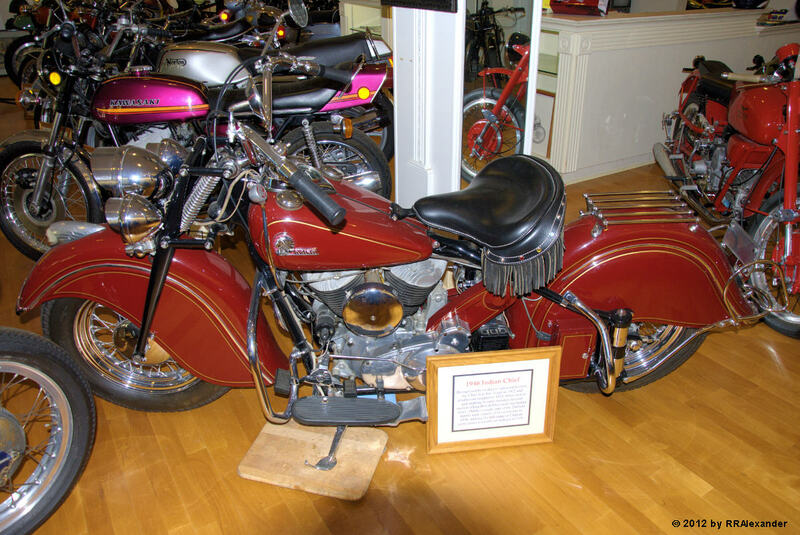 This one is on display at the Vintage Motorcycle Museum in Solvang, California. 9. Yamaha XS 750 Triple A running triple owned by Paul Simmons of Geneseo, New York. This is a page in the menu bar’s Motorcycles and Gear menu, but the link here will take you to the page. 10. First Look: Kentmere 100 My first “test” of the 100 ISO black and white film by Kentmere.